I got 2 strawberry plants from the local nursery But then I googled and read that they r not going to produce this yr??? They are of Tristar variety and right now they are in small cups. I want to plant them in containers. How big sould they be? Is the variety you bought a June Bearing or Everbearing variety? It is everbearing varity. Can I use a regular pot? I put mine is a regular pot with the holes on the bottom. They are looking good and the strawberry's started getting red! Here's a pic..it's Strawberry "Cardinal". Don't remove the flowers. 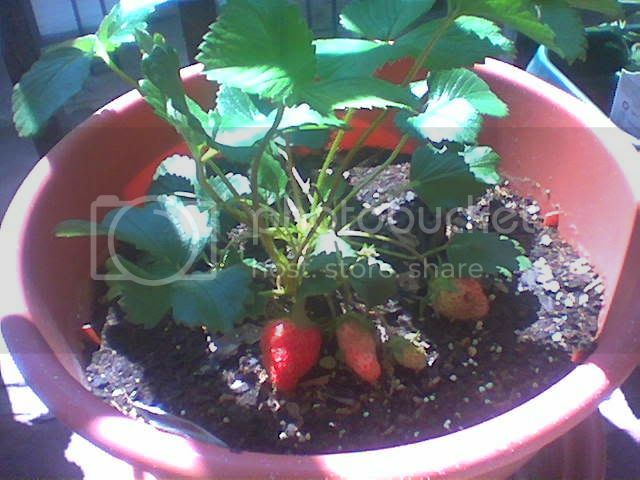 Those are small strawberry's growing. Each one grows differently so you'll have one gib..one small..like in the pic. Actually for Tristars its recommended you pinch off the flowers until June, and pinch off the runners the first year. This will focus on growth of the plant and will produce better fruit during the summer until fall. I just plnated Tristars myself! It that also true for Ozark Beauty's? I have about 10 of those planted. I bought a strawberry plant at walmart and this is my first year growing them! I can't wait to eat my first berries from them!! I noticed yesterday that they'd produced a flower. should I go ahead and pinch it off or just leave it? the plant is pretty small. Jamie, they recommend pinching them off for the first year, as this puts more energy into the growth of the plant making future harvests greater. I am leaving for vacation next month (for 3 months) so i'm thinking about letting my sister pinch the flowers while i am gone. What do you ladies think? Pinch them off until June- if it is an everbearing-they should produce fruit this year into fall! Jamie, maybe leave one plant "unpinched" so you can have a couple of strawberries this year for fun? That's what I do. I haven't googled the "Tristar" Strawberry, but I can't think of any reason why a Strawberry plant wouldn't produce in the first year... ...the "life span" of a Strawberry plant is only about 3 years! (The plant itself won't necessarily die off, but it will slow its production markedly after the 3rd year.) Terry is right... pick those first blossoms off, & that will force energy back into the plant & you should get a better yield. Strawberry plants are a garden's version of rabbits! Picking those first flowers isn't going to make any difference (other than strengthening the plant), because most of those blossoms will fall off & NOT turn into berries, as there aren't many insects out yet anyway, to pollinate them. The only reason a plant wouldn't produce berries in its "first year" would be because it's a brand new plant that has formed from a runner vine (sent out by the main plant), but that's not considered its first year. "First year" plants are ones that have set roots down... usually the year after they form on the runner. Strawberrys do not need to be pollinized to set fruit- they set fruit and get pollinized afterwards. Basically the seeds of a strawberrys is what get produced when pollinized. That is why strawberry will fruit indoors, if you take them inside!